Sir John Hutton, Chairman of the LCC formally opened Bishops Park in 1893. The park included land known as Bishop’s Walk, Bishop’s Meadow and West Meadow which were conveyed by the Ecclesiastical Commissioners, as Lords of the Manor of Fulham, to the Fulham District Board of Works on the condition that the land should be laid out and maintained as a public recreation ground. The Meadows had already been protected from flooding by the creation of an embankment. In addition, the river wall was built by Joseph Mears between 1889 and 1893. The park was extended in 1894 prior to opening in 1900, by the inclusion of Pryor’s Bank and its gardens. Although the house (then called Vine cottage) was demolished in 1897, the old gardens were preserved. The gardens contain stone figure sculptures depicting “Adoration”, “ Protection”, “ Grief” and “Leda”, presented by the sculptor J Wedgewood. 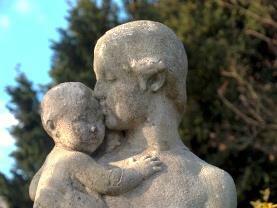 A further sculpture “Affection”, a mother and child by Herman Cawthorn was added in 1963. The grounds of Fulham Palace, from 16th century one of the most important botanical Gardens in London; obtaining national and international significance and under Bishop Compton, who moved to the palace in 1685. With the aid of George London, the most renowned and skilled gardener of his day, the collection was embellished in 17th century with many exotic species including tulip, walnut and maple trees and a cork oak. Seeds and plants came from collectors in the American Colonies, India and North America. This tradition of collecting continued in 18th century when Bishop Porteous planted several cedars and into 19th century when Bishop Blomfield planted deciduous cypress and ailanthus. Roque’s Map of 1741-45 shows the Palace to have been surrounded by formal gardens. They were replaced by landscaped grounds c.1770. The moat, which surrounded the Palace, was filled in 1921-24; archaeological excavations have shown that it had its origins in pre–Saxon defences.